Internet browsers intensively use a folder on your hard disk for temporary data — browser cache. There are various reasons why some users want to relocate this folder. For example, moving the cache to a RAM disk can speed up browsing, offload the HDD, or reduce the wear-and-tear of the SSD. SoftPerfect Cache Relocator is a quick and easy way to move your browser cache. This utility is intended to be used in conjunction with SoftPerfect RAM Disk, which offers all the benefits of creating disks in RAM: increase in computer performance, mitigation of the physical disk’s wear-and-tear, and reduction of file system fragmentation. Portable application, no installation required. 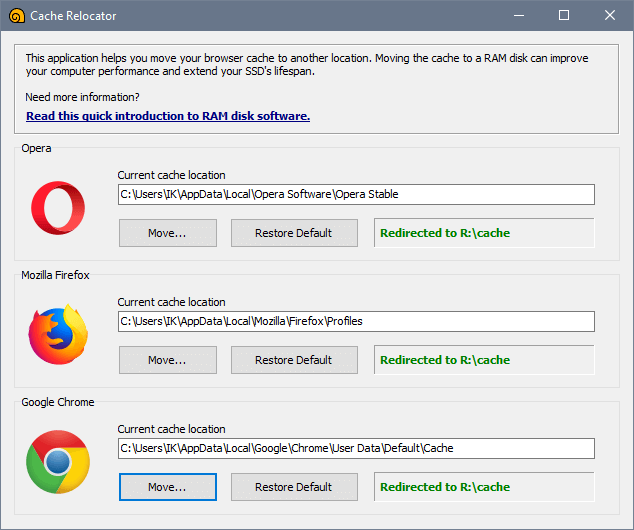 Cache Relocator creates a symbolic link and redirects the cache to the location of your choice.